(Houston, Texas) —- Today, Houston Businessman and Energy Executive Ramon Manning and his wife Karen, hosted a private campaign lunch event at their home in Houston’s Third Ward for State of Texas Governor Rick Perry. 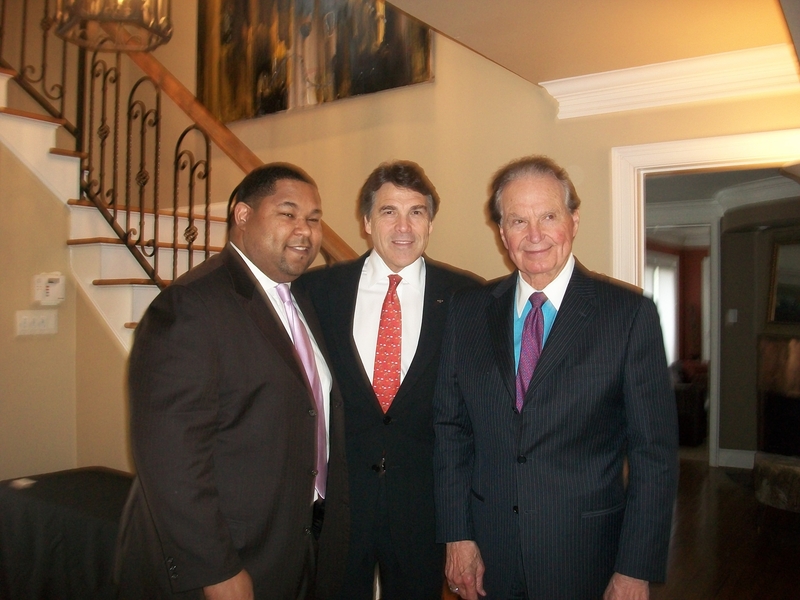 In the photograph from left to right are: Ramon Manning, Texas Governor Rick Perry and Welcome W. Wilson, Sr., Chairman of the UH System Board of Regents. The Houston Professional Fire Fighters Association has endorsed Republican incumbent Rick Perry in the race for Governor of Texas. I called Jeff Caynon, president of the group, after receiving the endorsement notice from the Perry campaign. Caynon explained that his group has a friendly incumbent rule. “The governor has been supportive and signed legislation that is backed by our firefighters, so we try to stick with friendly incumbents,” said Caynon. The endorsment is not only for the republican party primary, it also extends to the general election in November. AUSTIN – Gov. Rick Perry today received the endorsement of the Houston Professional Fire Fighters Association Local #341 for re-election in 2010. The Houston Professional Fire Fighters Association Local #341 represents nearly 4,000 of Houston’s bravest men and women. The Houston Fire Department is the 3rd largest fire department in the nation. Texans haven’t voted in the March 2nd primary, but a new polls shows that Democrat and former Houston Mayor Bill White has a good chance of defeating Republican incumbent Governor Rick Perry in the general election matchup. Supporters say the poll is good news for White. After this week’s debate with rival Farouk Shami, voters are getting to know him, and like what they see. White’s campaign only recently started running statewide ads that focus on his positive message of boosting education achievement in Texas. Meanwhile, Perry’s record in office is facing tougher public scrutiny as a result of the negative primary campaign against Sen. Kay Bailey Hutchison and Debra Medina. There’s still a chance that Perry will avoid a runoff, but he will emerge from the primary a bruised candidate. Voters shouldn’t discount Perry as a result of this or any other poll: he’s never lost an election and he remains popular with conservatives. Still, Mayor White is clearly going to be the candidate to watch closely in the general election! Below are some highlights of the poll, as well as some notes about Bill White’s campaign success that have led to the strong showing in the polls.http://www.dailykos.com/statepoll/2010/2/10/TX/444>http://www.billwhitefortexas.com/multimedia/ads/>– Feb 10, and has a 4% MOE. A total of 600 likely voters who vote regularly in state elections were interviewed statewide by telephone. From their poll:– showing that even those on the right recognize the validity of their poll numbers. In May 2008, Nate Silver with the national polling website www.fivethirtyeight.com rated them as one of the top polling groups in the country – ahead of other groups that have polled recently in Texas, including Public Policy Polling, Zogby, Gallup, and just behind Rasmussen. 1. White outraised both Perry and Hutchison in the last reporting period, and has $6.4 million COH. 3. White has opened regional field offices across Texas — in Harris, Travis, Bexar, Dallas, Tarrant, Hidalgo, Webb, Cameron, Jefferson, & Bowie counties — and will be opening one in El Paso on Monday. That list of counties includes every county that went Democratic in 2008. 4. White has been endorsed by the AFL-CIO, TSTA, Tejano Democrats, the Statesman, Texas League of Conservation Voters, 12 State Senators, 66 House Reps, & many, many, many more. Those interviewed were selected by the random variation of the last four digits of telephone numbers. A cross-section of exchanges was utilized in order to ensure an accurate reflection of the state. Quotas were assigned to reflect the voter registration of distribution by county. The margin for error, according to standards customarily used by statisticians, is no more than plus or minus 4% percentage points. This means that there is a 95 percent probability that the “true” figure would fall within that range if the entire population were sampled. The margin for error is higher for any subgroup, such as for gender or party affiliation.